Two of the most important unsolved problems in heliospheric physics are the origin of the solar wind and the heating of the solar corona. Some observations suggest that Alfvén wave (AW) turbulence in the extended solar atmosphere may be key to solving these unknowns. However, those in the scientific community remain divided about the importance of AW turbulence, mainly because they still do not possess a detailed understanding of the properties of AW turbulence close to the Sun. Convective motions at the Sun’s surface shake the magnetic field lines that connect the solar surface to the distant interplanetary medium. This shaking launches Alfvén waves into the solar atmosphere. (AWs are ubiquitous in magnetized astrophysical plasmas and analogous to waves on a string, where the magnetic field lines play the role of the string.) Once these waves enter the solar atmosphere, they become turbulent, causing wave energy to cascade from large scales to small scales and dissipate, heating the ambient plasma. This heating increases the plasma pressure, accelerating plasma away from the Sun. Researchers from the Space Science Center at the University of New Hampshire, led by co-principal investigators Jean Perez and Benjamin Chandran, expect to arrive at new theoretical understandings in this area through their INCITE research. 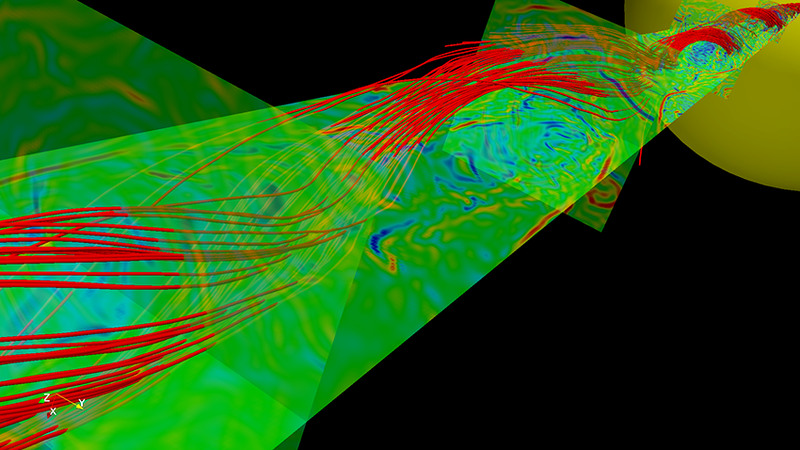 The team is conducting the first direct numerical simulations of AW turbulence in the extended solar atmosphere that account for the inhomogeneities in the density, flow speed, and background magnetic field within a narrow magnetic flux tube extending from roughly one solar radius to eleven solar radii. They are comparing numerical simulations conducted on Argonne Leadership Computing Facility (ALCF) supercomputers with remote observations. “Our work will provide new insights into the basic properties of inhomogeneous AW turbulence and make a major contribution to scientists’ understanding of coronal heating and the origin of the solar wind,” notes Perez. To carry out the research, the team is using the Inhomogeneous Reduced Magnetohydrodynamics Code (e.g., IRMHD Code) developed by Perez. The code has excellent weak and strong scaling properties and has been extensively tested and benchmarked on Intrepid, the Blue Gene/P supercomputer at the ALCF. TAU’s profile visualization tool, ParaProf, allowed the research team to quickly identify sources of performance bottlenecks in the application using the graphical interface. Figure 2 shows the shape of four key routines in ParaProf’s 3-D display. Using the information gathered, a non-blocking communication substrate was designed and a more efficient implementation of the underlying FFT library was deployed. Figure 3 shows how the overall execution time was reduced from 528.18 core hours to 70.85 core hours (13.41%) using TAU, for a small 2,048-processor execution on Intrepid. “By choosing the best communication strategy for Intrepid, the time in some key routines was reduced by nearly half. This performance improvement translates into big savings—millions of CPU hours. This has allowed a more complete and well-resolved physics study with the project’s INCITE hours,” notes Tim Williams, ALCF Catalyst for the project. The simulations being conducted for the project are of added interest to the space physics community, given the preparations now under way for NASA’s Solar Probe Plus mission. With a planned launch date in 2018, this mission will send a spacecraft in to a distance of closest approach to the Sun of 9.5R☉—inside the region that the researchers are simulating numerically. The simulations will enable detailed comparisons with future spacecraft measurements, contributing significantly to the science return of this pioneering mission. Figure 1. A snapshot of turbulent magnetic field lines (red) inside a coronal hole that expands from a small patch on the solar surface to 5 solar radii. AW, launched by convective motions on the photosphere, propagate in the inhomogeneous Solar atmosphere, producing primary reflected waves that interact non-linearly with the outward waves, driving a turbulent cascade. This cascade continues with secondary reflections in a very complex interplay between wave reflections and nonlinear interactions. Selected slices across the simulation domain show contours of plasma current, indicating the generation of small-scale structures where the turbulent energy ultimately dissipates. Figure 2. 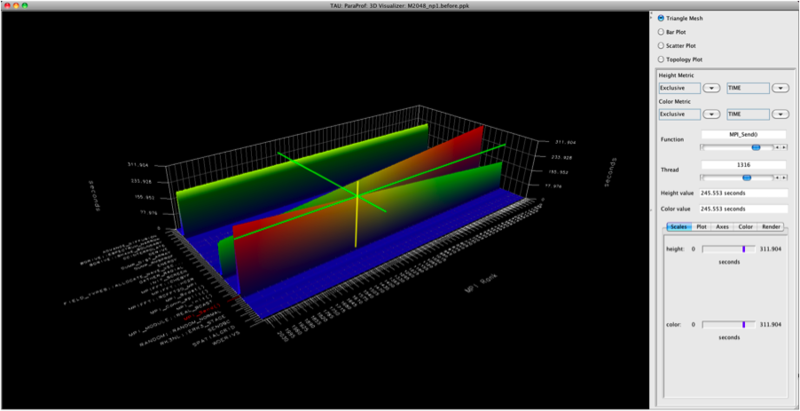 ParaProf 3D window shows the shape of communication routines for a 2,048-core execution. Figure 3. 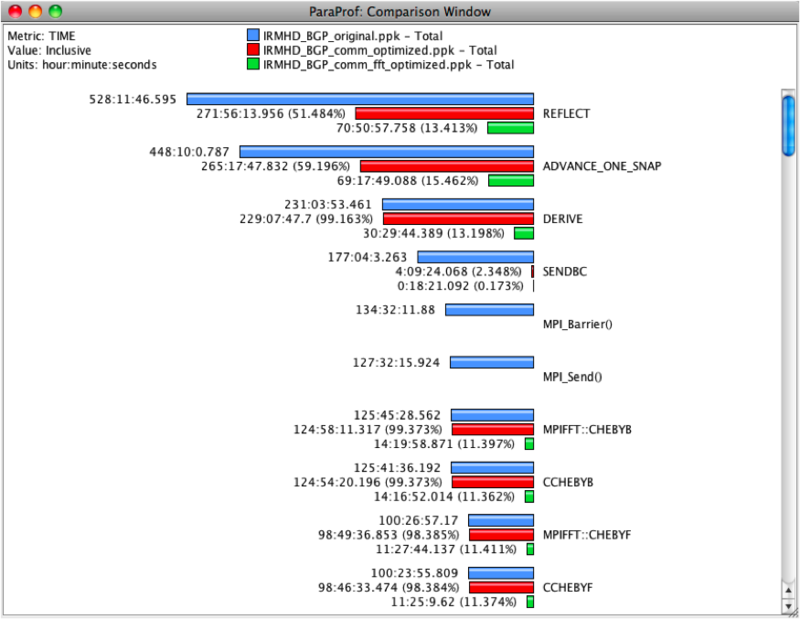 TAU's ParaProf shows the impact of performance optimization after restructuring the communication and FFT routines.